This research report allows readers to statistically compare their organization’s adoption of Model Based Enterprise to the rest of the industry. 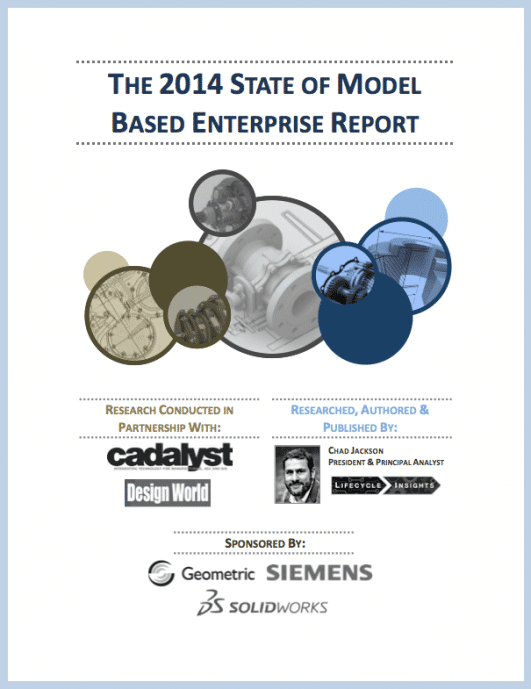 Right now, Model Based Enterprise initiatives are hot. It is often the buzz of the industry as some companies are contractually required to hand over 3D models with embedded Product Manufacturing Information (PMI). But are there really problems with engineering documentation today? How many organizations are really moving on these initiatives? Does it truly provide value in return? Answering those questions is the purpose of this research report. Sharing findings from The Model Based Enterprise Study, which collected survey responses from over 500 respondents, this report provides an in-depth perspective on the state of model-based enterprise (MBE) initiatives, including validation of today’s engineering documentation issues, revealing current adoption levels of such initiatives, identifying the most used technologies as well as value realized by organizations. For engineering executives and managers, this eBook is an important reference for any organization considering the deployment of a Model Based Enterprise initiative. For technical engineering leaders, it provides insight into what set of technologies are required for such initiatives. Is there a problem with engineering documentation today? Before charging off to look at Model Based Enterprise initiatives, I thought it would be prudent to find some answers to that question. If the answer is an unequivocal ‘yes’, then there are issues that Model Based efforts can address. The findings in this study that answers that question come in two forms. The first set focuses on how frequently problem areas persist in today’s engineering organizations. The second set focuses on a quantification of how much time engineering and manufacturing roles spend creating, amending and clarifying their documentation. Both are valuable in understanding the problems that Model Based initiatives can address.